Readings: Gen 6:5-8, 7:1-5, 10; Mk 8:14-21. 1/ Reading I: NAB Genesis 6:5 When the LORD saw how great was man's wickedness on earth, and how no desire that his heart conceived was ever anything but evil, 6 he regretted that he had made man on the earth, and his heart was grieved. 7 So the LORD said: "I will wipe out from the earth the men whom I have created, and not only the men, but also the beasts and the creeping things and the birds of the air, for I am sorry that I made them." 8 But Noah found favor with the LORD. NAB Genesis 7:1 Then the LORD said to Noah: "Go into the ark, you and all your household, for you alone in this age have I found to be truly just. 2 Of every clean animal, take with you seven pairs, a male and its mate; and of the unclean animals, one pair, a male and its mate; 3 likewise, of every clean bird of the air, seven pairs, a male and a female, and of all the unclean birds, one pair, a male and a female. Thus you will keep their issue alive over all the earth. 4 Seven days from now I will bring rain down on the earth for forty days and forty nights, and so I will wipe out from the surface of the earth every moving creature that I have made." 5 Noah did just as the LORD had commanded him. 10 As soon as the seven days were over, the waters of the flood came upon the earth. 2/ Gospel: NAB Mark 8:14 They had forgotten to bring bread, and they had only one loaf with them in the boat. 15 He enjoined them, "Watch out, guard against the leaven of the Pharisees and the leaven of Herod." 16 They concluded among themselves that it was because they had no bread. 17 When he became aware of this he said to them, "Why do you conclude that it is because you have no bread? Do you not yet understand or comprehend? Are your hearts hardened? 18 Do you have eyes and not see, ears and not hear? And do you not remember, 19 when I broke the five loaves for the five thousand, how many wicker baskets full of fragments you picked up?" They answered him, "Twelve." 20 "When I broke the seven loaves for the four thousand, how many full baskets of fragments did you pick up?" They answered (him), "Seven." 21 He said to them, "Do you still not understand?" I. THEME: We need to live our faith in life. Faith isn’t only knowledge about God but also the applying of this knowledge in our life. If we don’t live what we believe, faith is only in our mind and has no help for our life (Jam 2:14). For examples, if we believe in God’s providence, we should not be worried a lots about what we shall eat or drink or wear? Or if we believe the most important thing in life is to save our soul and the souls of others, we should spend lots of time for studying and preaching the Good News. Today readings illustrate examples of those who lived or didn’t live their faith. In the first reading, Noah found favor with God because he absolutely put his faith in God while all of his contemporaries lived against it. In the Gospel, Jesus reminded his disciples, “Watch out, guard against the leaven of the Pharisees and the leaven of Herod." Because though they witnessed two big miracles: one for feeding the five thousand and one for feeding the four thousand people, they were still discussed among themselves that they had no bread. 1/ Reading I: God wanted to destroy all people. (1) People’s sins are the reason of the Great Flood: Because of their sins, people must accept the corresponding punishments. The reason why God doesn’t punish yet is because his time isn’t come yet. Nobody should think that he can commit a sin and avoid God’s punishments. (2) God has power both to create and to recreate all things: Through the Great Flood and all the well-known floods everywhere in the world, we recognize one truth: if God wants to wipe out the earth, he only needs to let it rain continuously in several days. 1.2/ Noah’s faith and the rescue: Righteousness is the reason why God saved Noah’s family. He was considered as a righteous man because he completely put his trust in God and quickly did what he commands. For example, why all people laughed at him because he told them the Great Flood is going to happen, he still believed in God’s word and finished his building of the ark. The Great Flood also shows God’s justice: Though only his family believed in God, he shall not wipe out his family together with all other people. 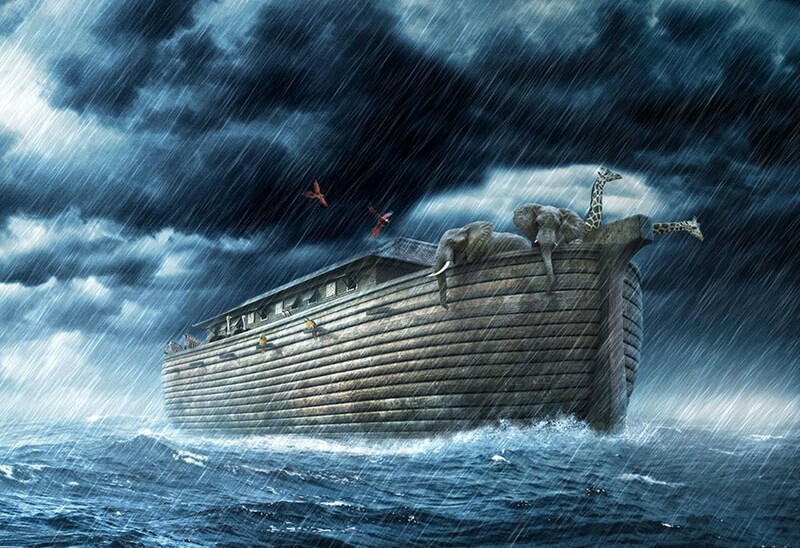 Noah’s ark has a huge dimension: 300 cubits in length, 50 cubits in wide and 30 cubits in height. One cubit is equivalent to 18 inches. If one wants to convert these dimensions in English dimensions, the ark is 450 feet in length, 75 feet in wide and 45 feet in height. This is a huge ship if one compares it with some great modern ships. For examples: The Mayflower ship of England has its length only 90 feet; the ark is five times longer than the Mayflower. In addition to the selection of all living creatures and carrying them into the ship, it took a long time for Noah to finish them. 2.1/ Disciples’ worriness: “Now they had forgotten to bring bread; and they had only one loaf with them in the boat.And he cautioned them, saying, "Take heed! Be aware of the leaven of the Pharisees and the leaven of Herod. "And they discussed it with one another, saying, "We have no bread." Leaven is a piece of old flour, its purpose is to raise a new dough before baking it. A small piece of leaven can raise a big amount of flour. The Jews sometimes identify devils’ works with leaven. (1) Pharisees’ leaven: They want to have a powerful Messiah who can work miracles and bring material gains. In yesterday reading, they came to Jesus and asked him to work miracles before they can believe in him. (2) Herode’s leaven: He paid attention to power, fame and enjoyment. Because of these, he denied the truth and beheaded John Baptist. When Jesus warned his disciples to guard against “the leaven of the Pharisees and the leaven of Herod,” he wanted to say to them, “Don’t pay too much attention to material dimension as them.” Moreover, Jesus was preparing for his disciples to accept a suffering Messiah to save people. The purpose of a miracle is to lighten up one’s faith. The disciples were enlightened twice, they still didn’t believe Jesus can multiply bread again for them to have bread to eat! This fact shows people can witness miracles but they are still lack of faith. - Our faith must be corresponded with our works, faith without work is dead (Jam 2:17). If we really believe in God’s word, we must practice his words in our life. - Jesus’ warning is still in effective for us today, “Take heed! Be aware of the leaven of the Pharisees and the leaven of Herod;” since many times we let the worldly worrisome govern our life. - If we live in opposite with what we believe, we shall have to pay a dear price for it. The Great Flood reminds us of our frailty body and the reality of our sins.